Now, in the right hand column! Thursday nights on NBC are now Must Flee TV. Viewers are now abandoning the 'cockers Thursday offerings in droves. 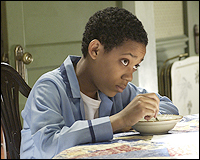 The premiere of Everybody Hates Chris on UPN even tied with the one hour premiere of Joey on NBC. UPN! Tying NBC in a Thursday time slot! How impossible would that have sounded two years ago? Meanwhile, CBS' CSI trounced The Apprentice, and the stunted preview of Criminal Minds (with Mandy friggin' Patinkin, fer chrissakes) even beat the long-in-tooth ER. Aside from the surprising success of My Name Is Earl, there's not much to be proud of over at NBC these days. Fox has signed Rosie Perez to a one-year holding deal to develop a comedy vehicle for the actress. I haven't been this excited since Neil Patrick "Doogie Howser" Harris announced his return to series TV. ABC will repeat the Lost season opener after receiving calls from irate viewers who missed part of the episode because of hurricane-related news pre-emptions. Apparently seeing the Emmy winning drama is more important to some than finding out when the roof is gonna blow off their trailer. The network will postpone Wednesday's scheduled premieres of George Lopez and Freddie for a week to make room for the rerun. The drama's second episode will still air at 9 p.m.
Last week's premiere nabbed an all-time high of 23.4 million viewers. Forrest Whitaker is getting his Shield. The actor has signed on as a regular for the FX police drama's upcoming fifth season. It premieres in January. Hopefully his addition will give the show a jump start. I may be the only one who felt the Emmy nominated Glenn Close sapped the life right out of wnat was once one of my favorite dramas.